Learn about the nuclear societies and associations of the Pacific Nuclear Council. in San Francisco, Calif. from Sept. 30 – Oct. 5, 2018. See what members comprise the Pacific Nuclear Council. 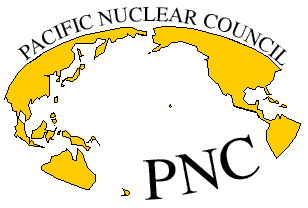 The Pacific Nuclear Council is composed primarily of nuclear societies and associations from nations around the Pacific Rim. The council exists to share information and best practices on the peaceful use of nuclear energy. Today, the council has working groups and task forces addressing waste management, advanced reactors, standards and public information programs. The council also co-sponsors the biennial Pacific Basin Nuclear Conference. Learn more about the members of the Pacific Nuclear Council. Join us for the 21st Pacific Basin Nuclear Conference, held in San Francisco, Calif., USA (Sept. 30 – Oct. 5, 2018). Read the latest in our papers and policy statements. Read the latest in current events. See U.S. Secretary of Energy Rick Perry note the importance of the conference on C-SPAN. If you have any questions or concerns, please reach us using the information below or by filling out the contact form. Someone will get back to you shortly.